That also means we'll have plenty of time for parties! I love entertaining and especially when we can do it outside in the yard. 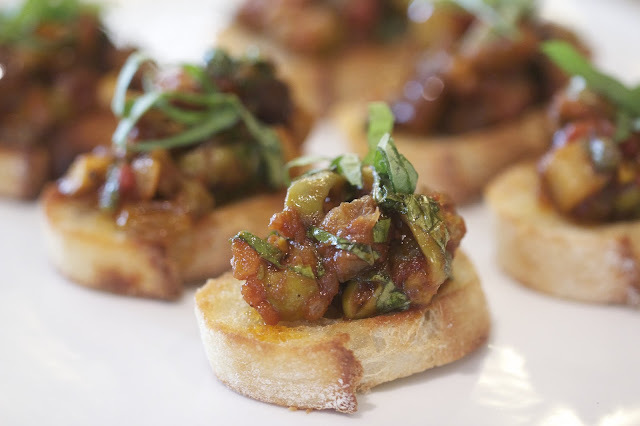 We're working on a date for our annual formal Dinner in the Garden party but I want many more formal and informal get togethers too. That means that I need some new recipes in the arsenal to keep things fresh and new. 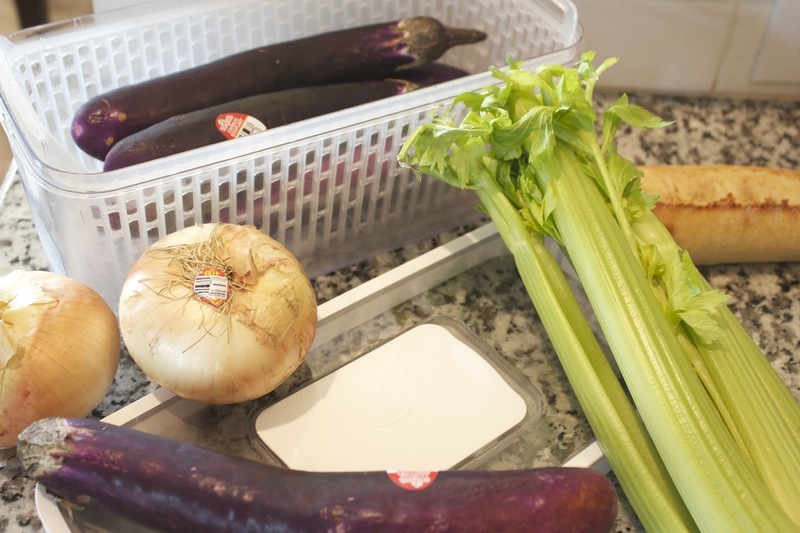 I love working with OXO and the recently sent me some fresh Chinese Eggplant from Melissa's produce along with this fantastic GreenSaver storage container (more on that below). I'm honestly not usually a huge fan of eggplant but I wanted to experiment with some new ways of using it and I needed some more appetizer ideas too. 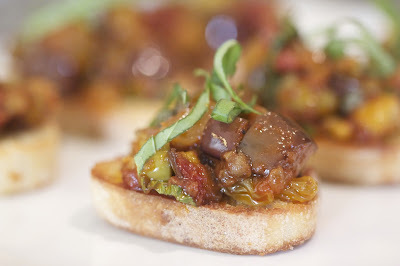 I came across this recipe for Eggplant Caponata and knew right away that I wanted to try it. It had so many great ingredients and although I started to doubt how it would all come together as I was making it, they are so amazing. I just couldn't stop eating it. 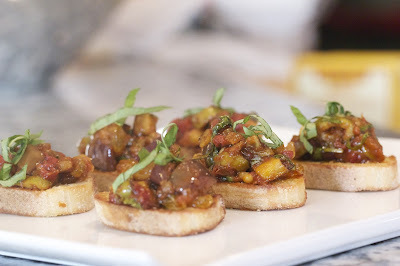 I love the sweet and sour combination and the tomatoes are so rich after being cooked down. My mouth is watering now just writing about it again. It is great served room temperature which is perfect for most entertaining and can be made up to a week ahead! We were actually in Mexico when the eggplant arrived and I had my Mother-in-law just put it in the GreenSaver container for me until I got home. It was over a week before I finally got to creating this recipe and yet it was still just as fresh and crisp! We are so bad at having things go bad in our fridge around here and I'm so glad we've got this now to help us save more if it! Did you know that the average family wastes for than 226 pounds of food a year from it going bad? That's pretty crazy. Fruits and vegetables give off ethylene gas. Exposing produce to ethylene gas speeds up the ripening process, causing it to overripen and go bad. When produce rests against the walls of containers, bags or crispers, moisture can build up and cause rotting. Fruits and vegetables require the perfect balance of humidity to keep them crisp and prevent wilting. To make things more difficult, different kinds of produce require different humidity levels to stay crisp. Activated carbon filters trap and absorb ethylene gas, slowing down the aging process and keeping produce fresh longer. The filters are made from coconut husks, making them safe, all-natural and non-toxic. The elevated basket lifts produce up and away from the container walls to promote airflow and help prevent rotting. It can also be removed and used as a colander. The adjustable vent on top of each Produce Keeper slides open and closed to maintain optimum humidity levels for different types of produce, keeping them crisp and fresh. Place chopped eggplant on a large sheet pan and sprinkle with 1/4 cup of the olive oil. Spread it into a flat layer and bake at 375 degrees for 20 minutes, turning after 10 minutes. Set aside and let cool. Heat remaining 1/4 cup of olive oil in a large skillet over medium high heat. Add the onion and celery and cook until softened and browned, about 10 minutes. Add the tomato paste and cook for about 2 minutes or until the tomato paste has begun to caramelize. Add the crushed tomatoes and cook for 10 minutes, stirring often. 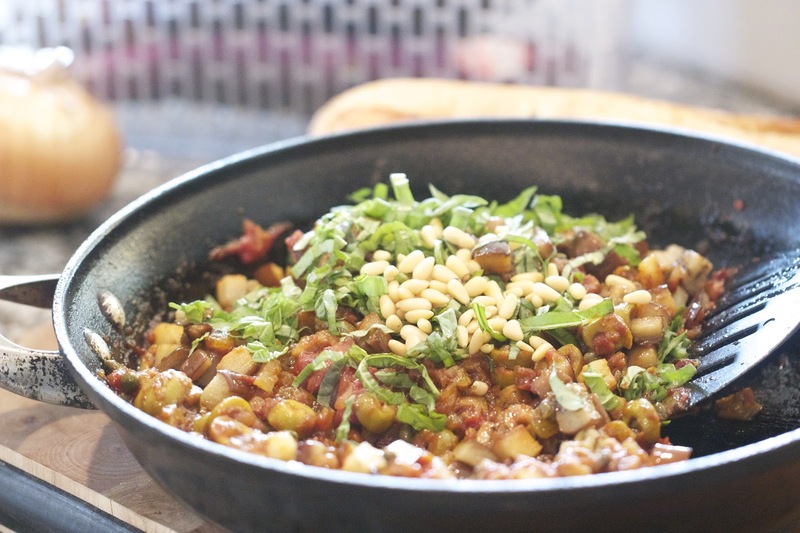 Stir in the olives, vinegar, raisins, capers, sugar and chocolate and continue to cook for an additional 15 minutes. The mixture will start to thicken and caramelize. Add the eggplant, basil and pine nuts and remove from heat. 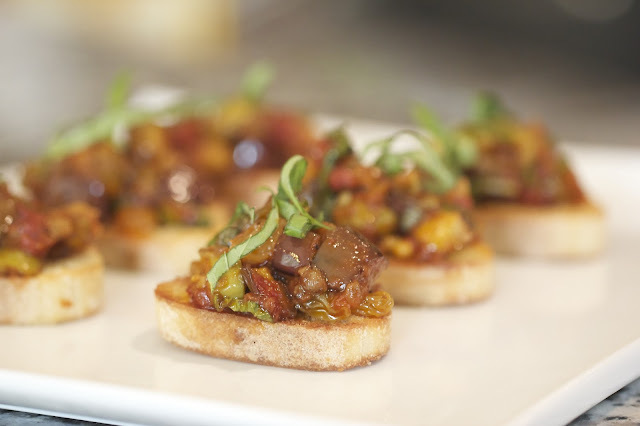 Allow to cool and then serve atop crostini. 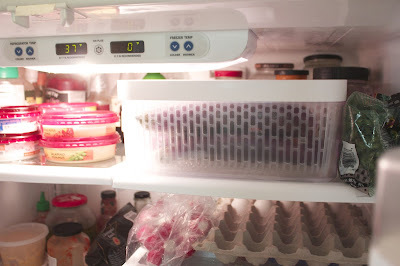 Disclosure: I was provided a free GreenSaver container from OXO and produce from Melissa's Produce. All opinions are my own. Great tasty recipe, keep it up good work. It is also helpful a lot and can download EMM 442 Grand Canyon Week 5 Complete Work ,loving your Post and also shared with friends. Bundle of Thanks!